This is the most important decision you will have to make about your room scheme. And it's a purely personal choice. Fortunately, there are hundreds, perhaps thousands of colours and designs available to you in the carpet shops - and it is even possible to have your colour especially dyed. It is impossible to reproduce accurate colours through your TV or computer monitor and the subtle variations in shade are limitless. 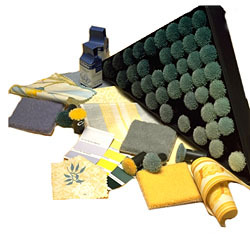 Your local carpet specialist shop is the only place where you can see actual samples. Each range that you see on this website is available in anything from 16 to 100 colours. Stop by your local carpet retailer to see the extent of colour choice. And, if you should find that you cannot see the colour you want, you can have a carpet made in exactly the colour of your choice - by Ryalux Carpets - and at no extra cost for quantities of 21 sqm and above.